A low magnification image of a germ cell tumor, called a teratocarcinoma, from a new mouse model developed to study testicular cancer. 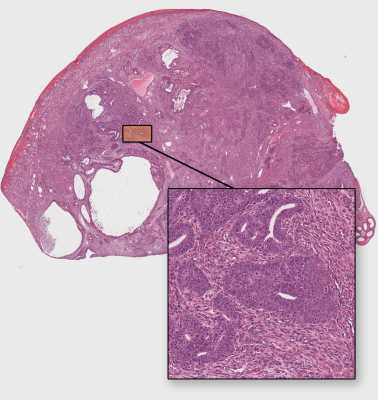 A cluster of cancer stem cells, termed embryonal carcinoma, is shown at higher magnification at the bottom. Response: There has been this puzzle in the field of cancer biology that testicular cancers, even after they have spread to the brain or the lungs, are often able to be cured with radiation and chemotherapy (think of Lance Armstrong, for instance), whereas the majority of cancers are not curable with similar treatments. We thought that this could be due to the unique properties of the cells from which the cancers are derived; testicular cancers arise from germ cells (which later go on to make sperm), whereas most cancers arise from somatic cells (body cells). We proposed that maybe the germ cells and somatic cells were hard-wired to respond differently to DNA damage, and that because of this, cancers derived from these two distinct types of cells might then respond differently to chemotherapies (which typically kill cancer cells by creating DNA damage). To test this, we generated a novel genetic mouse model that develops cancers similar to the malignant testicular cancers seen in young men. We then used standard chemotherapies (cisplatin alone, or combined bleomycin/etoposide/cisplatin), and found that treatment with DNA-damaging chemotherapies specifically killed the cancer stem cells within the tumors. Thus, we were able to show that testicular cancers are curable with standard DNA-damaging chemotherapies because their stem cells are highly sensitive to DNA damage. This is in contrast to most cancers, where the cancer stem cells are refractory to treatment and are responsible for tumor recurrence and metastasis. Response: We now have a much better understanding for why some cancers (specifically testicular cancers) are curable with chemotherapy, while others are not. For testicular cancers, chemotherapies destroy the most aggressive cells within the tumor, the cancer stem cells. Response: We hope that these insights will guide future research into how to sensitize other types of cancers to chemotherapy. If we can figure out what makes most cancer stem cells resistant to chemotherapy, we can develop more effective cancer treatments. A first step to that will be defining the molecular mechanisms that underlie responses to DNA damage in germ cells versus somatic cells. This entry was posted in Author Interviews, Cancer Research, Stem Cells and tagged cancer, stem cells, Testicular cancer by Marie Benz MD FAAD. Bookmark the permalink.